At Christmas time Mike Duffy, the famously corpulent and cherubic, but aging, former television newsman was rewarded for his many years as a Conservative shill. He was one of eighteen Conservative faithful to receive courtesy of their pal the Prime Minister, the crown jewel of Canadian political patronage – an appointment to the Senate of Canada. Among the party hacks, flaks and hangers-on like Duffy, a Senate appointment is a dream come true - the big enchilada of politics - the mother of all cushy political appointments. And no wonder. Senators make a base salary of $130,400 a year and get extra for serving as committee chairs. The pension is 75% of the Senator’s five best years of salary and is payable after the tender age of 55 and only six years in the Senate. And of course, it is indexed to the cost of living. And there is more. A Senator gets 64 free return trips a year anywhere in Canada by plane or train and can give away his ticket to someone else to use. If he lives 100 km or more from Ottawa, he can pick up an extra twenty grand a year in expenses. He also has a hundred fifty thou to fix up his new offices, and can hire staff, etc., all courtesy of you and I the loyal and faithful Canadian taxpayer. Ah, but was Duffy qualified to receive such munificence? Of course he was, and in two very important respects. First of all, his reporting on CTV in recent years so clearly supported his patrons, that alone would have made him a natural selection. But he is qualified to be a Conservative Senator in another very important way, as evidenced by his rich oratory in his maiden speech delivered in the Red Chamber on Tuesday. After buttering up his patron and offering an assortment of banalities, his blackberry buzzed - a big no, no in the Chamber. His comments in the Senate were a little tamer than what he said at the P.E.I. Progressive Conservative annual meeting a few days before. At that meeting Duffy, in referring to Ghiz and Williams said, "when two men get into bed together one is going to get the shaft, and I assure you it won't be Danny Williams." When pressed for an apology the classy Senator only had this to say: "Honourable senators, if the metaphor I used in my speech on Feb. 3 was offensive to some members of this chamber, I withdraw the metaphor." All of this reminded me of another instance that Duffy revealed something of himself. More than ten years ago he launched a defamation lawsuit against the now-defunct but wonderful publication known as Frank Magazine. During the proceedings he gave testimony that he had been deprived of an Order of Canada appointment because of the things that Frank had written about him. Duffy alleged that his source was Prime Minister Chretien no less. Of course, he was unable to prove his allegation. And so if shilling for the Conservatives was Duffy’s first qualification to be a Conservative Senator, what was the second qualification? It is the same characteristic possessed by present day Conservatives too numerous too mention. It is what has set people like Gerry Ritz, Myron Thompson, Art Hangar, Stephen Harper, Stockwell Day, John Baird, a host of other Conservatives and now Duffy, apart from distinguished and respectable parliamentarians. They all – Duffy among them - have no class. And so, being a Conservative shill and having no class, of course Senator Duffy is qualified to be a Conservative Senator. 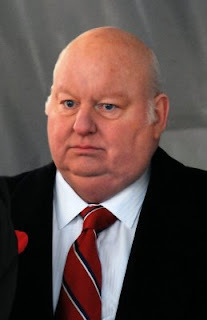 Mike Duffy is the living epitome of pork barrel. I was disgusted for years at his shameless partisanship, and things have only gotten worse now that Tom Clark has inherited that food-stained chair! The close connection between CTV and the Conservatives was made even more obvious this week when they all paraded into Parliament wearing red mittens, no doubt provided gratis by Peter McKay's fiancee. When CTV television reporter Mike Duffy reminded Margaret Trudeau that today would have been the birthday of her son Michel, who was killed in an avalanche in November 1998 at the age of 23, she rushed away and collapsed to her knees in grief on the parliamentary lawn.